Tulsa sweeps Wichita with back-to-back 6-5 wins and prepares for three-game weekend, including long-awaited return home. >> The Oilers fell behind 2-0 early Saturday in the first game of a weekend series at INTRUST Bank Arena, but battled back to score three consecutive first period power play goals. Stephen Perfettoscored the first two on his way to a three-point (2g, 1a) game, and Alex Dostietallied the third to put Tulsa in front 3-2. Wichita scored two more before the first period buzzer to lead 4-3 after a wild opening frame. Dostie tied the score at 4-4 in the middle stanza, recording a 3-point (2g, 1a) game in his return to the Oilers lineup from the American Hockey League’s San Diego Gulls. The Thunder regained the lead for a third time, but Charlie Sampairand Adam Pleskachboth scored to put Tulsa in front 6-5 at the end of two. The Oilers held Wichita off the board in the third period to squeak out the win in a game that saw five lead changes and five power play goals. >> Tulsa never led Sunday until Alex Dostiecompleted a come-from-behind 6-5 win with a goal 2:16 into overtime to sweep the Thunder and push Wichita closer to elimination from playoff contention. The Thunder led 2-0 after one, but Steven Kaunistostarted a three-point (1g, 2a) game with a goal 57 seconds into the middle period. The Thunder cushioned their lead to 3-1, but Tulsa inched closer when Adam Pleskachscored his league-leading 35thgoal of the season. Stephen Perfettoscored a power play goal with 4:58 left in the frame to tie things up at 3-3, but Wichita responded with a power play marker of its own two minutes later to regain the lead. Ryan Tesinktied the game with 20 seconds left in a second period that featured six combined goals. The Thunder jumped in front a third time 4:32 into the third, but Roman Ammirato evened the score at 5-5 just 26 seconds later as the game went to overtime. Tulsa moved within one point of first place Idaho with seven games remaining. 3/22 – Alex Dostie(F) assigned to Tulsa from San Diego (AHL) by Anaheim (NHL). 3/22 – Craig Pefley(F) released from standard player contract. 3/22 – Keegan Asmundson(G) released from standard player contract. Stephen Perfettohas 16 points (5g, 11a) during a 7-game point streak. Steven Kaunisto had 5 points (1g, 4a) in Tulsa’s two wins last weekend. Jared Thomas has 12 assists in his last 8 games, including 4 assists over the weekend. 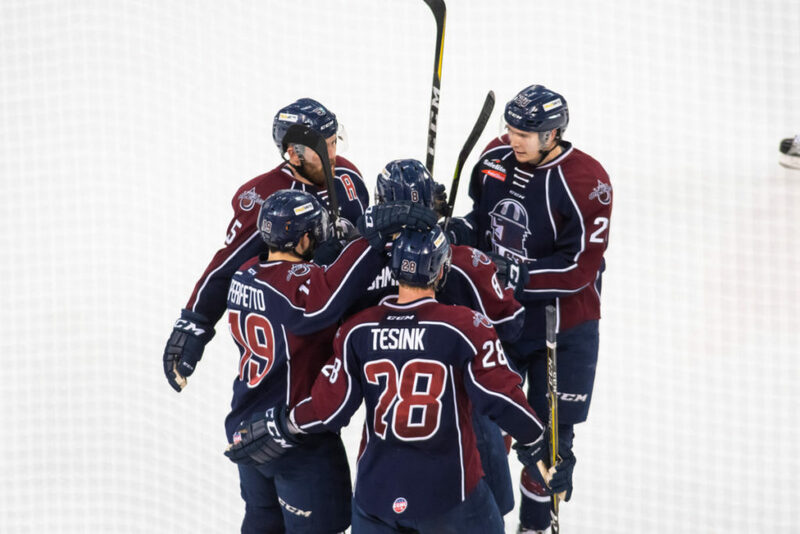 Tulsa set ECHL franchise records Sunday for wins (38) and points (82) in a season. The Oilers’ power play went 4-for-10 (40%) over the weekend. Tulsa has won 4 straight games and 8 of its last 9 dating back to Feb. 23. Adam Pleskachis 1stin the ECHL with 35 goals, 4thwith 67 points and tied for 1stwith 13 power play goals… Charlie Sampairis tied for 3rdwith 7 game-winning goals… Ryan Tesinkis tied for 13thin points (60)… Devin Williams is 3rdin the ECHL in goals-against average (2.21)… Dylan Bredois tied for 5thamong league defensemen in assists (32) and tied for 12thin points (37)… Steven Kaunisto is 2ndamong defensemen with 4 game-winning goals… Jared Thomasis 4thamong rookies with 58 points and tied for 1stin assists (40). The Oilers return home for the first time in 27 days Saturday and host the Utah Grizzlies at 7:05 p.m. at the BOK Center. Additionally, Tulsa will be celebrating its fourth annual Alzheimer’s Awareness Night, as the Oilers players will wear special purple jerseys which will be auctioned off following the game in the OneOK Club on the concourse level. Proceeds from the jersey auction and other Alzheimer’s themed memorabilia will benefit the Alzheimer’s Association. Tulsa and Utah finish the weekend with a Sunday matinee at 4:05 p.m. at the BOK Center. Following the game, fans will have the opportunity to skate on the ice with the Oilers players. A limited number of skates will be available for rent, but fans who own their own skates are welcome to bring them.